While wired and wireless routers are generally the preferred choices when it comes to increasing the capabilities of the home network, those routers have to be connected to a modem provided by the ISP. Some prefer an all-in-one solution that includes a modem, a wireless router, and Gigabit Ethernet as well. Fortunately, there are quite a few popular devices to choose from and each has its own strengths and weaknesses. Earlier, we have covered some of the best routers under $50 and best gaming routers. Do check them out if you’re looking for a more conventional router setup. In this article, we will look at some of the best modem router combos in 2018. Using a modem router combo has its own advantages and disadvantages. Generally, users pay a monthly modem rental to their ISP in addition to their plan charges. If you intend to stick with the ISP for a long time, the monthly rental can add up every month. However, you can forego the monthly rental to your ISP by a one-time investment in a modem router combo. The compact all-in-one setup also ensures less clutter on the desk and can also add to the aesthetics. The main disadvantage of this combination is that you need to ensure that your ISP’s connection works well with the modem you intend to buy. 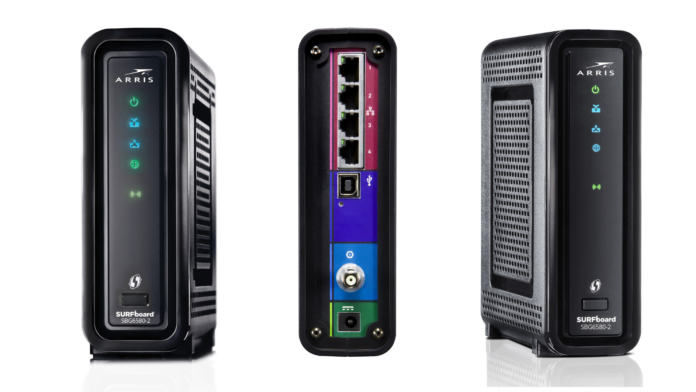 Not all modem router combinations are certified to work with all ISPs. Also, some devices might actually limit the speeds your ISP can provide so discretion must be exercised while purchasing one. For this article, several factors were considered for narrowing down the available best modem router combos such as the maximum cable speed supported, names of ISPs that are compatible, number of bands that the router supports, the combined data transfer rate across all bands, connectivity options, software UI etc. So, with that information, let’s get started. The NETGEAR Nighthawk C7000 is one of the best modem-router combos you can find in 2018. First and foremost, it is a DOCSIS 3.0 modem that is compatible with most ISPs including Comcast Xfinity, Spectrum, Cox, and CableONE. It supports speeds up to 960 Mbps and on top of that has dual-band AC wireless capability and a 4 Gigabit Ethernet switch. With 24 downstream and 8 upstream channels, the Nighthawk C7000 offers a great all-in-one solution if you prefer something more advanced than the typical cable modem solution offered by most ISPs. Setting up the Nighthawk C7000 is an easy affair but you might need to purchase a coax cable separately as it does not come included in the box. While the reliability issues are far and few in between, NETGEAR support is particularly not known to be the best in the business. It is not a cheap solution, but definitely worth it considering the combination of features and performance on offer. TP-Link is a familiar name when it comes to routers and the Archer CR1900 is one of the best selling modem router combos. It is approved for speeds up to 500 Mbps on most US ISP networks and the DOCSIS 3.0 support means that it is futureproofed for at least a few years down the line. The Archer CR1900 sports dedicated CPUs for managing incoming and outgoing traffic so that there is no lag while streaming HD or 4K videos and while playing games. As with any TP-Link router, you get a TP-Link Tether App that helps manage the functions of the router from your smartphone. While the Archer CR1900 works with all approved cable providers, make sure to check with your ISP before ordering one. Some ISP settings are known not to play well with this router. A good thing with this device, however, is that the range is very good and it eliminates the need for using separate Wi-Fi extenders. The Motorola MG7550 works as a good Comcast modem router combo that also works with many other US cable ISPs such as Cox, Charter Spectrum, Time Warner, etc. The modem part of it supports speeds up to 300 Mbps while the dual-band AC wireless has a theoretical maximum bandwidth up to 1.9 Gbps. It has internal antennas that are amplified by Wi-Fi power amplifiers that deliver high performance within the legal power limit. Support for AnyBeam beamforming means that reaching clients in the corners or behind obstacles should not pose a problem. The MG7550 supports 16 upstream and 4 downstream channels. While this may be lesser than the 24×8 channel bonding offered by some others in this list, it does not make any difference to day-to-day use unless a large number of clients are connected. The web interface allows easy configuration and activation of your ISP’s service. Just be aware that there are reports of ISPs being able to change the admin password of the web interface. Motorola is yet to address this issue. The ARRIS Surfboard SBG7580 is known for its channel bonding prowess. With 32 upstream and 8 downstream channels, you’ll be hardpressed to complain about network bottlenecks even while using your connection speeds to the maximum limit. The built-in McAfee security suite ensures adequate protection from DDoS attacks. The Surfboard SBG7580 is also a capable wireless router with support for dual bands and a maximum theoretical speed up to 1.7 Gbps. This modem router combo is compatible with most cable ISPs. As expected though, it does not work with offerings from ATT, Verizon, or CenturyLink. Performance-wise, the ARRIS Surfboard gets the job done perfectly but watch out for some reported latency flaws due to the onboard Intel Puma 6 chipset. The NETGEAR C6250 is one of the best modem router combos recommended for gaming or streaming multimedia. It supports a theoretical maximum throughput of 680 Mbps on cable and 1.6 Gbps on wireless. The built-in USB port allows using a USB drive or NAS storage for sharing media with other connected clients. It works with most cable providers but always check with your local operator to confirm compliance. With the dual Gigabit Ethernet ports, connecting wired peripherals is also very easy. There are not many downsides to this router performance-wise. However, it is only approved for speeds up to 300 Mbps so if you’ve opted for faster plans, it is better to look at other options. Also, make sure you inform your ISP, especially Comcast, and confirm if your modem router has been registered in their database or not. Otherwise, you might get disconnected after a few days of use. One of the reasons for opting to go with the modem router combo route is to minimize the monthly modem rentals. If you opt for a costlier option, it might take time before the router starts paying for itself. However, you can accelerate that process by option for a router less than $100. The NETGEAR N600 fits such a scenario. For less than $100, the N600 will make your internet connection rent-free in less than 10 months. It does not skimp on too many features either. You get the same DOCSIS 3.0 support, parental controls, and USB media sharing as found in some of the more expensive options. It also works great with most ISPs out of the box, especially Comcast. But there are few compromises, though. The N600 is approved for speeds only up to 340 Mbps and even though it is a dual-band AC router, the combined throughput is only 600 Mbps. It also supports only 8 upstream and 4 downstream channels simultaneously so if you’re a heavy user, those channels can get crowded quickly. Still, for a no-frills all-in-one solution, the NETGEAR N600 is hard to miss. There are only a few options if you’re looking for your own ADSL/VDSL modem router combo and the Motorola MD1600 is one of them. The MD1600 supports most ADSL/VDSL providers and can easily hook up to your existing telephone line. The included USB 2.0 port allows for attaching USB drives and NAS devices for easy file sharing across the network. Sudden discharges often occur during thunderstorms via telephone lines that can damage valuable connected equipment. To prevent this, the MD1600 also offers surge and lightning protection. While the MD1600 is said to be compatible with CenturyLink and Frontier, it does not work with Verizon or ATT. It also does not work with services that use bonded VDSL/ADSL or VDSL-Vectoring. We suggest you check with your DSL provider for compatibility before purchasing this modem. Motorola is known for its customer service so you shouldn’t be facing issues on that front. Also, be sure to download the latest firmware updates to ensure better compatibility with your provider. If you’re looking for a fully loaded modem router combo, look no further than the Motorola MG7700. The MG7700 is approved by Comcast Xfinity but can also work with other cable providers such as Cox and Charter Spectrum. With 24 upstream and 8 downstream channels, you can be sure that the full potential of your cable connection is utilized. The built-in dual-band AC router offers a maximum throughput of 1.9 Gbps, which should be enough to power most connected devices at home. The MG7700 can be easily configured using a web interface and it also offers a built-in firewall, parental controls, and guest network access. Do note that while Motorola says this works for Charter Spectrum, Spectrum is yet to officially approve this model. Apart from that, there is little to complain about. There are no USB ports so this device cannot function as a media server. The range for the wireless antenna is good and should be able to cover a moderately-sized home easily. Top 10 Best Modems of 2018 – Top Options That Pay for Themselves Over Time! The Best DD-WRT Routers in 2018 – Upgrade Your Networking Equipment to the Max! Dear readers, that would be all for our list of the best modem-router combo to consider buying in 2018. If you have additional questions, don’t hesitate to post a comment below. We will do our best to provide a timely response.